A thin sheet or layer of tissue that lines a cavity or separates two parts of the body. A membrane can act as a filter, allowing some particles to pass from one part of the body to another while keeping others where they are. 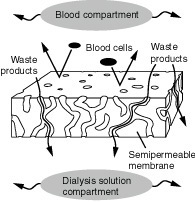 The membrane in a dialyzer filters waste products from the blood.